Get Your Official BonnevilleAmerica.com Member Patch! 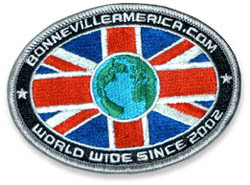 Show your member pride and support the site by ordering your BonnevilleAmerica.com Official Member Patch. BonnevilleAmerica.com is one of the largest worldwide, online motorcycles clubs ever! These patches are fully embroidered and full color. Patch dimensions 4″ x 2-7/8″, and they are oval in shape. Patches are only (US)$5.00 each. For Postage rates, please refer to the postage chart, below. It takes a sufficient amount of funds and time, to keep this site running. By purchasing a patch, you are helping to ensure the future of this community. Your money goes toward, hosting and bandwidth fees, development, and hardware and software expenses. There are two ways to get your Official Patch. You can either send a money order or cashiers check (please NO personal checks or cash) via mail, or you can pay online using Paypal (see below). PLEASE DO NOT MAKE CHECKS OR MONEY ORDERS OUT TO BONNEVILLEAMERICA.COM! I can’t deposit those.